Formerly Go Pro DJs. A New name and a New look! 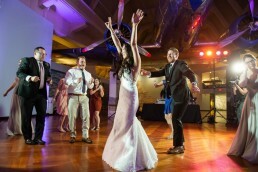 More specifically what do our wedding DJs do? It may seem like an obvious answer… We play music, right? Right. But that’s only part of it. 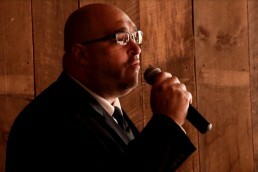 We’re also your emcee which puts us in a unique position to oversee the flow of your wedding. It’s up to us to make sure all activities like your grand entrance, formal dances, speeches, etc., are on-time and carried out properly. We have one chance to get it right so our organization, preparation, and communication with you is key. We take a lot of time preparing and discussing details with you all the way up to your big day so you can enjoy it and dance the night away. Hi! Our first meeting is about us listening to your needs and answering your questions. Been to many weddings? What made them fun or not so fun for you? We’ll explain the different types of mixing our DJs can perform and ask which you like. This is how we get to know your style and what you’re looking for. 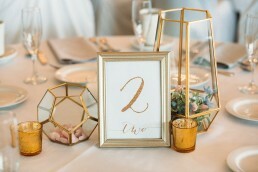 What’s your venue and what room or rooms will you be in? Is it outdoors? Do you need an extra speaker for your ceremony or cocktail hour? 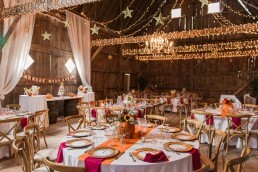 Some couples have unique activities at their wedding. For example, let’s say your best friend is performing an acapella song before dinner. You may need a mic stand for her. All these questions help us figure out what equipment you’ll need. 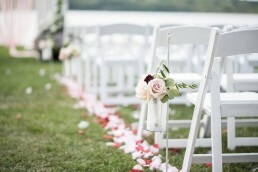 We also take you through a typical wedding timeline so you’ll know exactly what to expect from us. Each of our couples receives an Online Entertainment Planner which plays an important role in your planning process. This thing is pretty awesome! It’s where you plan out your playlists, timeline, wedding party names and more. We teach you how it works, check in on your progress every so often and send you friendly reminder emails and tips along the way. 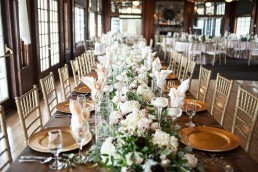 We also spend a lot of time answering questions and giving advice leading up to your big day. Yahoo! So, it’s time to get all the details set. We have a final phone meeting with you the week of your wedding to go over all the details in your Online Entertainment Planner. You may have some last minute changes, need to add equipment or just need to elaborate on something. 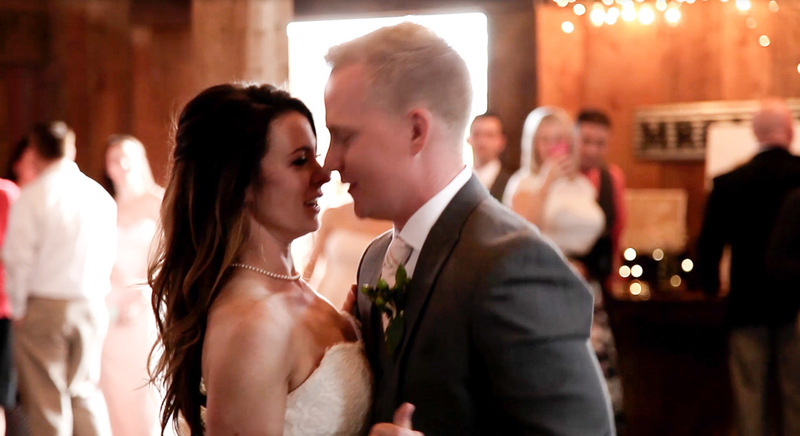 We’ll go over your music choices, formal dance songs, timeline, wedding party name pronunciations, special requests, logistics and answer any questions. This meeting is about making sure we have all your details correct so we’re ready-to-go. After the meeting, your DJ creates a copy of your Online Entertainment Planner to work from throughout your wedding. After your final meeting, we go through your playlists and make sure we have all the songs you’ve requested. If you have some rare song requests that we can’t find online we’ll ask you for a copy. Need an edit of a song? We’ll create one for you. We store all our music on our laptops and create specific playlists. We also create a backup copy of all your playlists and our music library on an external hard drive, iPad or additional laptop. This way if anything goes wrong technically, we still have our backup organized and ready-to-go. Pretty darn cool, huh? Your big day is here! Nervous? Don’t be. At least about your entertainment, that is. We’ve got it covered. So, our day starts by loading up the equipment and double-checking everything. We keep an eye on weather and traffic reports to make sure there aren’t any big delays. We arrive no less than 2 hours before our start-time to set up equipment and perform sound checks. We also coordinate with your officiant, wedding planner and/or coordinator and go over your timeline with your other vendors. This is an important step so all your vendors are on the same page about what order and time all the fun stuff is gonna happen. Once your officiant is on-site, we coordinate with them by getting cues for the start of your processional and recessional songs. We also set them up with their mic and go through a quick ceremony timeline. 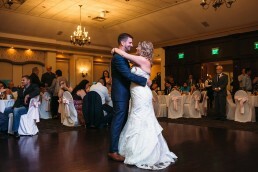 Most couples have their DJ provide 30 minutes of music as their guests are arriving leading up to the start of the ceremony. It’s a great way to set the mood. We’re not just your DJ. We’re also your Emcee. It’s actually a huge part of our job. Another term for it is your Master of Ceremonies. That sounds official! We’re responsible for following your timeline, keeping the flow of the night running smooth and announcing all your wedding reception activities like the grand entrance, formal dances and speeches. We keep you updated on your timeline and let you know if an activity needs to be moved because of something running early or late. We never make any changes unless you approve it. Whether it’s your playlist or one we create just for you, Cocktail Hour & Dinner Music is played in the background so everyone can have a good chat. 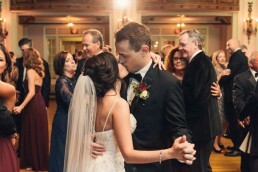 Once it’s time to hit the dance floor, we pay close attention to what your guests are responding to. We read your crowd, play your requests, play guests’ requests (the ones that make sense) and play the hits that everyone knows and loves. We’re always thinking ahead about what to play next so we can keep your dance floor energetic and packed. 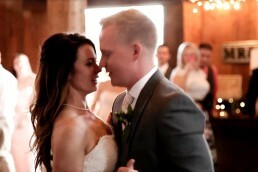 This is what makes a great wedding DJ. After we play your last song, we break down all the equipment, pack up and wish you the best! There you have it. 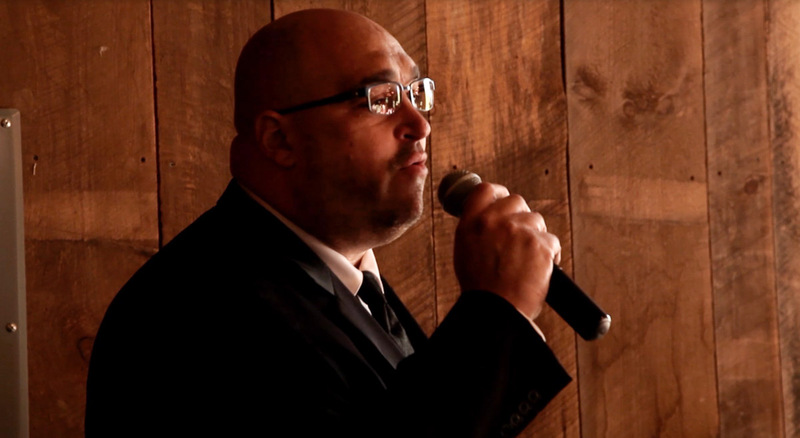 A professional wedding DJ is busy the week of your wedding all the way up to your last song. We curate your music, answer questions, figure out logistics, go over your timeline, learn pronunciations, coordinate with vendors, and make sure we have all the right equipment ready-to-go. 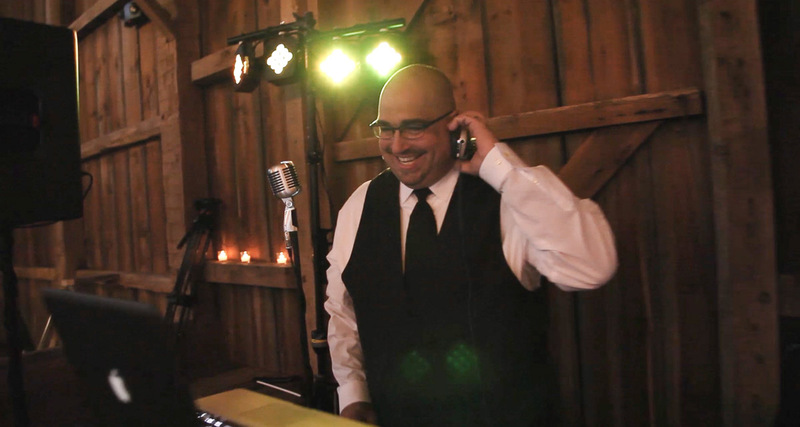 We hope this answered your question of what does a wedding DJ do. 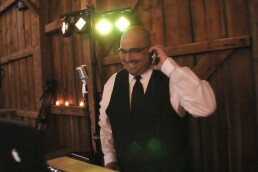 Interested in our Professional Wedding DJ services?